My major interest is how we can use horse feed both as medicine, preventively and therapeutically. Therefore I highly recommend Regulator Complete®! Regulator Complete is the most versatile and high quality supplement for horses. This type of feed contains everything the horse needs – in combination with quality roughage and salt. When you give Regulator Complete as a supplement feed to your horse, you can be sure that it gets everything it needs. Research results show that the bonds in the minerals are precisely as they should be. You will learn that your vet bills are less expensive – and you will worry less about your horse’s well-being. Regulator Complete is easy to adjust according to the horses’ needs. This means, that both high performance horses and broodmares benefit from it, but this feed is also perfect for foals, colts (colts in groups can/should be fed their week’s ration distributed in 3-4 days a week), young horses and adult horses. REMEMBER! Your horse should always have access to salt – either as extra salt added to their diet or as a salt lick. Regulator Complete has a low content of salt and starch. Low salt content means that the feed does not easily absorb liquid from the environment in which it is stored. It prolongs the shelf life significantly. Eva Lydeking is a trained nurse, a nutrition consultant /therapist at Suzette van Hauenstein-Drucker, a homeopath and a psychotherapist. And she is a MPH student (Master of Public Health). 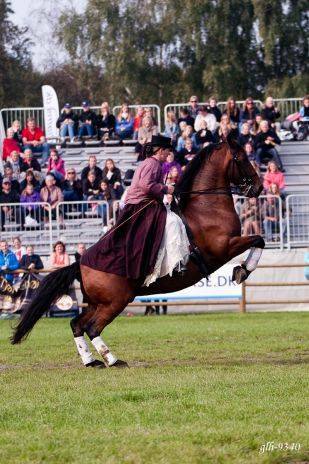 Eva Lydeking is an active member of the Lipizzanerforeningen, where she works as an auditor and as a deputy director. Eva Lydeking is an inspiring person and a highly knowledgeable woman and has 20 years of clinical work experience with nutrition therapy, research and nutrition therapy education. She has founded the Institute for Optimum Nutrition. Áhugaverðar upplýsingar um lífræn, ólífræn steinefni og hey. IS +354 867 0469 til þess að fá upplýsingar um Regulator Complete®. Einnig er hægt að hafa samband við okkur í gegnum Facebook eða sendu tölvupóst á fyrirhestinn@gmail.com og við svörum eins fljótt og auðið er.